There is much debate in the freedom movement, and especially in the voluntaryist / abolitionist / market-anarchist community, on whether Ron Paul 's candidacy is helpful or harmful to the cause of freedom. Given the high stakes involved, this is no surprise. We face a truly desperate situation  both politically and economically , with the recent meltdown of Bear Stearns  and much other bad news leading to speculation that Monday (July 30, 2007) will see a major drop in the Dow and perhaps other signs of an impending economic collapse. Exact timing and velocity of such events are never predictable, but trends, history, and current situations are knowable -- and they all suggest, at least to me, that the time is near for a storm-of-the-century economic jolt. In addition, many believe the administration or some rogue element in the FedGov plans a false flag operation this summer, in the form of another massive terrorist event , to justify the imposition of martial law  and an attack on Iran . The recent executive order  allowing for confiscation of property from anti-war protesters  (or from essentially anyone the Secretary of the Treasury wishes to target, given the extremely vague wording of the order) has added to the concern. This order becomes law, unless Congress acts to prevent it, in mid-August. Many Americans are deeply concerned about where this is all headed. For that matter, many are downright terrified, and I think with good reason. It makes sense, then, that Dr. Paul's presidential campaign is drawing supporters from parts of the political spectrum that are normally hostile to each other. Many Democrats support Paul for his anti-war stance, while many anti-state market anarchists  (who believe the political process is mostly a way to falsely legitimize the exercise of coercive power) are also supporting this most unexpected of Republican candidates. To see why, it helps to remember that Paul was the Libertarian Party's presidential candidate in 1988. His message has not changed since then: Paul remains a small-government libertarian. Elected to Congress ten times, Dr. Paul has a long record of voting in accordance with his libertarian and constitutionalist principles. Paul's nickname -- "Dr. No" -- stems from his consistent voting against any bill that is not clearly authorized by the Constitution. In many cases, Paul's vote has been the only vote opposing an increase in State power. Will Tyranny and Economic Disaster Lead us to a Free and Compassionate World? The debate in libertarian circles about whether to support or reject Ron Paul's campaign is essentially a debate over which methods and tactics will best serve to move us in the direction of more love and more freedom. My stand on the issue is that Paul's candidacy is the best thing we could have hoped for at this moment in time, and that the dramatic growth in support for Dr. Paul's campaign is just about the only bright spot in our current situation. Large numbers of people in America are rallying to, learning about, and becoming excited about the idea of freedom. This is a first in my lifetime, and I am old enough to remember when Ike was president. I am not concerned that most of these people are not yet abolitionists; they are opening their eyes to reality, and embracing freedom as they understand it. That is a start, and without a start, one never gets anywhere. I see little in history to suggest that dictatorships or economic disasters are good for the cause of freedom, and much to suggest the opposite. Here in America , the (government-caused) Great Depression led to FDR unconstitutionally  criminalizing gold ownership  and massively increasing the size of the federal government. FDR also schemed to get America into WWII and then targeted a racial minority (Japanese-Americans) for internment in concentration camps  during the war. None of this led the American public to rise up and take their freedoms back; instead, both the media elite and the public in general seemed enamored of FDR at the time, and that bizarre affection continues. Hitler came to power after Germany's hyperinflation episode  had done to Germans what Mugabe's hyperinflation is now doing to those in Zimbabwe . Tyranny and over-issued fiat currency turned each of those nations into a dangerous madhouse, where all but the super-rich were impoverished and where the local currency was worthless, where necessities were increasingly scarce, and where desperation was the constant tone of life. It took Germany 's defeat in WWII to end the nightmare in what became West Germany , while in East Germany it took another lifetime beyond that, until the fall of Communism in Eastern Europe . Tens of millions were murdered by the Nazis and later by the Communists, and for every victim murdered, hundreds more were terrorized or completely impoverished or harmed in some other way. Zimbabwe is still in the midst of the storm, and I note that freedom-seekers are not flocking there. To say it plainly: all the historical evidence I have seen suggests that a massive social, economic, or political breakdown in America will not somehow lead to more freedom, but rather to hardship and perhaps to outright horror on an epic scale, lasting for decades or longer. The path to freedom lies in another direction. The disaster we are so clearly headed for is a threat to love and freedom, for us and for generations to come. Love and freedom together are the foundation of any healthy society, which makes this cause for serious alarm. Nothing else matters so much as do love and freedom. Cultural details and religious beliefs can vary; such things are largely matters of taste and familiarity. But love and freedom are essentials -- they are important regardless of anything else. When levels of love and freedom are high, other things take care of themselves. Without high levels of love and freedom, disaster is certain. 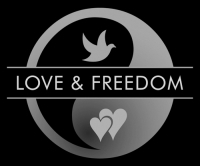 Love and freedom require each other because these two characteristics are integral parts of a basic human duality. For that reason, neither love nor freedom survives for long without the other. If Paradise is, as I see it, simply a healthy world characterized by love and freedom, then Hell would be the opposite: an unhealthy world of widespread, severe neurosis and tyranny. Imagine such a world, and shudder -- a world so unhealthy that death camps and wars were commonplace horrors and where hundreds of millions  of people might be killed in such fashion in a single century. Imagine a world with people so miserable as to substitute greed (for things, lovers, power, or anything else) for the love they needed but did not get in childhood and infancy -- a need which no amount of getting in the present could satisfy. Imagine a world where some damaged souls were so miserable, alienated, and angry as to actually enjoy hurting others on purpose. Imagine those people, in particular, gravitating to the ego-stroking power that comes with an authoritarian government job. Hitler, Mao, Idi Amin, Pol Pot, and dozens of others come to mind -- along with their underlings and henchmen, right down to the jackbooted thugs on the streets. Look carefully, and you will see their shadows gathering in today's America . If even thinking about such a world is almost too much to bear, I understand. Preventing such an abomination from materializing here is the most important immediate task of this generation. What methods and tactics have the best chance of preventing a descent into iron-fisted dictatorship in this country? How can we best encourage movement, instead, in the direction of more love and freedom? At this moment, here in these United States , Ron Paul's surprise campaign for president is by far the most powerful and positive tool we have -- and I say that as an abolitionist, not a minarchist. Getting to the goal requires that we at least begin moving in the direction of the goal, and nothing else has accomplished that in my lifetime. Dr. Paul, and the thousands of volunteers drawn to his campaign, are educating the public about freedom and are creating such enthusiasm that even the corporate, mainstream media is having trouble ignoring the phenomenon. It is actually possible that the Paul campaign will, directly or indirectly, halt and perhaps even begin reversing the slide into tyranny that has, until now, seemed unstoppable. If there is anything more positive for the future of freedom and compassion in this country, I have yet to see it. I urge you to support Ron Paul's campaign in whatever way you can.